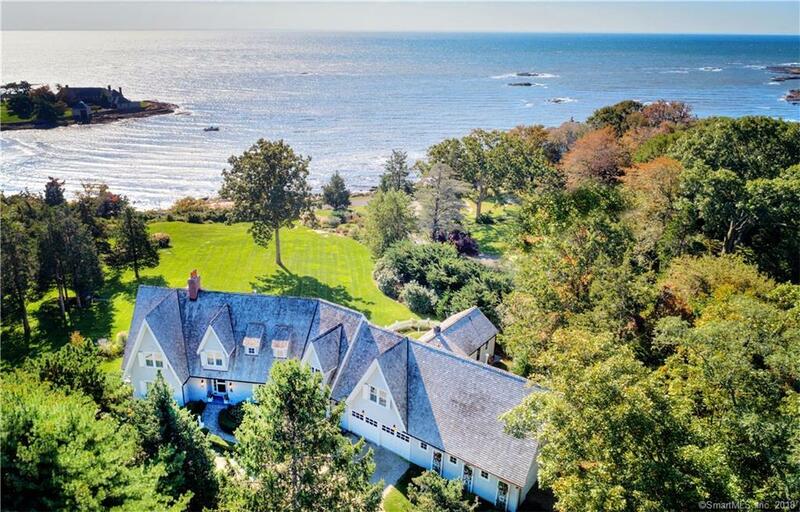 Enchanting Waterfront Estate, requiring no flood insurance, in Guilford, Connecticutâs desirable Sachemâs Head Association. Main residence perched at an approximate 27 foot elevation offers sweeping views of the Sound out to Long Island. Adorable guest cottage, nestled inside a quaint, gated garden, offers all the comforts of home for out of town guests or extended family. Enjoy a small private beach in which this property shares a one fifth ownership or walk just a few steps to the associationsâ private beach and tennis courts. Sprawling yard overlooking the Sound offers the perfect landscape for afternoon whiffle ball games, touch football or a simple quiet cocktail amidst the amazing views. Main residence boasts over 5,200 square feet of living space and offers 4 bedroom suites, four fireplaces, and a wall of French doors beckoning residents to the homes stone patio beneath a white columned pergola. The attached, but separate guest cottage boasts a family room with fireplace, modest kitchen, full bath and two bedrooms. Directions: Guilford Green To Water Street. Water Street To Vineyard Point Road To Corner Of Falcon Road. Home On The Right.